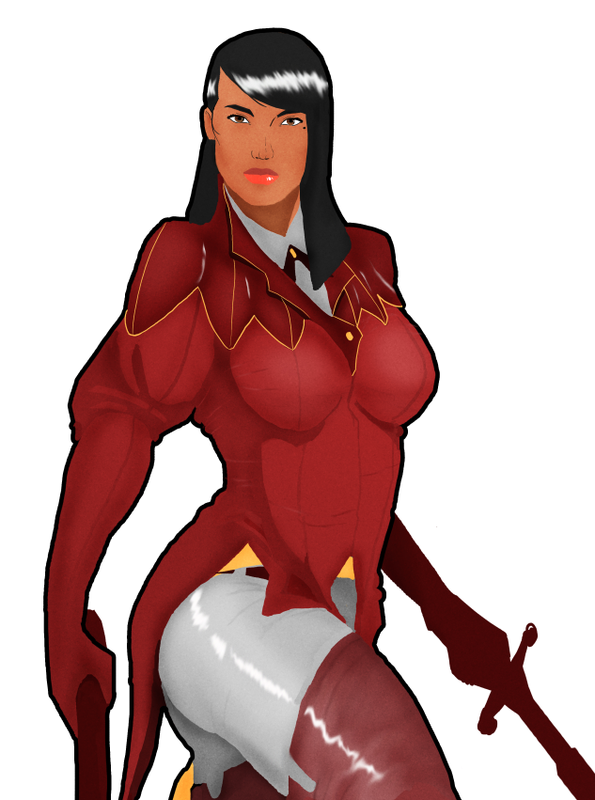 Roxanne Vasquez is a famous Inquisitor, one that descended out of a long line of commanders, investigators and warriors. Where most Inquisitors specialize in hunting mutants, vixens or cultists, Roxanne has secretly been fighting the rotten parts within the Inquisition and the entirety of the armed forces. Armed with musket, sword and two decades of field experience, Roxanne is a force to be reckoned with. We have always made an effort to make a proper mixture of characters that are innovative, and introducing the classic archetypes in our game system. After Cole, a pretty experimental character, we have now arrived at the fourth and last alpha character: Roxanne Vasquez. Roxanne is a charge character in the classic sense, as such she has solid pokes and quick specials. Unlike other characters that have one or two supers (excluding the shatter super), Roxanne has powered-up versions of every special attack in her repertoire. While these powered-up moves lack the devastating damage of most supers in our game, they are potent reversals that should keep the opponent on their toes all the time. In lieu with this design, Roxanne builds bar way faster than the average characters. This allows her to incorporate these supers into her combos more often than other characters. We had some worries about how this will pan out with her shatter super, since she would build super at such a rate that hitting a shatter would almost always end up in a shatter super. We have chosen to not diminish the damage on her shatter super but rather to make hitting a shatter a bit more difficult for her than it would be for other characters. Roxanne’s game plan is about about zoning, strong reversals, and decent pressure strings. Roxanne is a solid wall with strong footsies, but lacking the superb offensive capabilities of grappler and mix-up characters. Characters in development stage and subject to change. This entry was posted in Characters on April 13, 2014 by Marijn. Cole is a former Inquisition soldier, he used to be part of one of the elite mutant hunting brigades, equipped with powerful hook weapons that were used for both combat and terrain scaling. He is now on the run, branded as a defector by the Inquisition as they consider him a threat to their cause. While Cole will be a ‘basic’ character in the sense that he has a lot of basic and easy to understand tools, his moveset has its own little twist. Cole does not have special moves in the traditional sense. He has a set of normal moves, just like every other character, but besides that he has a second set of ‘normals’ that can be accessed by holding back or down/back for a short period of time. As soon as he is charged, all his normal attacks will change into these ‘charged normal’ attacks. Cole’s regular normals are simply a variety of punches and kicks, but his charged attacks uses the hook on chain that is attached to his glove. For example his crouching hard punch is a uppercut move that works well as an anti-air. The charged crouching hard punch will grab people out of the air with the chain and slam them onto the ground. Other moves will allow him to use the hook for sweeping, poking, launching himself towards the opponent, pulling the opponent towards him or latching himself to the ground from the air. This entry was posted in Characters on April 1, 2014 by Marijn. As promised we will commence with introducing our future characters. 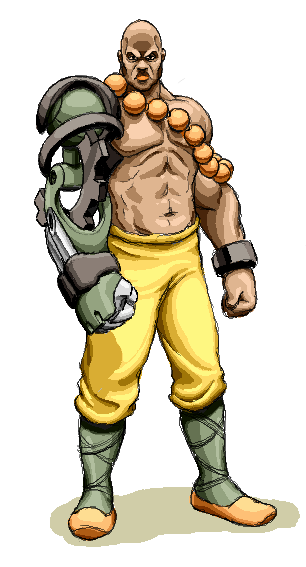 The first character that we will start working on after Julia, is the monk Ushah. Ushah is a veteran of many battles, his unwavering resolve to combat supernatural creatures has made him an experienced and formidable warrior, but it has had a high cost on his body. Scarred, battered and having lost one of his arms in one of his many battles, he now wields an ancient artifact fused with his prosthetic arm. The artifact resembles the Lion, a long extinct animal in the world of Shattered, but revered as a beast of mythical proportions as a symbol of courage and perseverance. Ushah is less mobile than other characters, and this also reflects in his moves. Ushah does not have moves that can be used to improve his movement. Rather than that, he has moves that allows him to strongly defend the position he is in, while slowly inching closer to his opponent. Most of his heavy normals have armor (meaning that parts of the body during the move can absorb an attack before hitting the opponent), he can also generate a steam attack from his mechanical arm that has a pretty big area of effect and is able to negate enemy fireballs. His normal attacks are strong, long-ranged attacks, which are slower than those of other characters. For example, Ushah’s hard punch is a high straight punch with his mechanical arm, whose armor can block jump-in attacks, and blast straight through. As such, the move is quite a potent anti-air move. Once Ushah is able to get close, the opponent is forced to choose to stay standing and risk getting grabbed or jump away from Ushah’s command grab and risk getting hit by one of Ushah’s excellent normals that can catch jump-aways. Below you find a concept art of Ushah’s mechanical Lion arm, and an early concept of Ushah. This entry was posted in Characters on March 19, 2014 by Marijn. Last weekend we had a good opportunity to playtest our game at LLL.MBR’s bootcamp. More than a dozen people tried Shattered over 2 days and gave their input. While the game is still in a fairly bare bones state, the people trying the game weren’t hampered at all in exploring the game, developing inventive footsie games and quickly discovering new tech. People seemed to enjoy the game a lot and were eager to give suggestions and their opinions. Seeing people enjoy our game is incredibly satisfying and one of the reasons why we are making this game, and why we will continue to push forward. We were aware of the presence of some bugs in this build, and another few others were discovered, but overall the game is really starting to come together and become a truly playable experience. We’ve of course made some recordings of the matches as well! In these videos you will see one of the most prominent bugs that we were aware of even before this testing session: Multiple fireballs can be on the screen at once. The players were quick to find out that this meant that throwing fireballs is very strong, as you will see in the videos below. The first match is between Pr3y on the left and LLL.MBR on the right. We also ran a small tournament with the guys present at the bootcamp. We’ve made some recordings of the finals between LLL.MBR (left) and EX Snorlax (right), some of the rounds of these finals can be seen in this video. Shoutouts to Miku for managing to unintentionally crash our engine every 20 seconds. This entry was posted in Gameplay, video on March 3, 2014 by Marijn. We have previously discussed a large portion of the system mechanics, both in our blog posts and on our System page. But, while we set out to make a simple but engaging game system, it is only part of what makes it the game. The other half is arguably the one that will be much harder to get working properly: getting every moveset of every character balanced, while staying different enough to deliver good character diversity. While we do not intend to make every character so different that it is as if they come from different games, we want to have wildly varied movesets.This however forced us to make some strict agreements so that it would prevent designs from going overboard. One of the most important limitations we have set early on was that no character would have character-specific set of resources. The amount of impact these will have, differs per character and resource type. Super bar, for instance, will always play a massive role for every character, while fighters that rely on health for special mechanics will be comparatively rare. One example where we changed the impact of the super bar would be for Roxanne, whose supers are more akin to EX moves than to actual supers. We initially planned to split her super bar up into smaller segments, but we eventually decided against that, as that would qualify as a character-specific subsystem, which is something we specifically try to avoid. Instead, her super bar will fill much faster than that of other characters, which is used to power stronger versions of her special moves, but these will obviously lack the punch of actual supers. This gave us some issues with her shatter super, which obviously uses the same bar, possibly giving her way too many opportunities to use that super on a shattered opponent. While we could lower the damage of this super, to be more like her “EX moves”, we felt like this would reduce the excitement of landing a shatter super. Instead, we want to solve this by lowering her overall shatter damage and thus decreasing the chance of shattering her opponent. Another example is one of our future characters, which will feature a cancel that the player can use at any moment to reset their frames to neutral, effectively resetting the character and giving the possibility to retaliate out of blockstun or to extend combos. 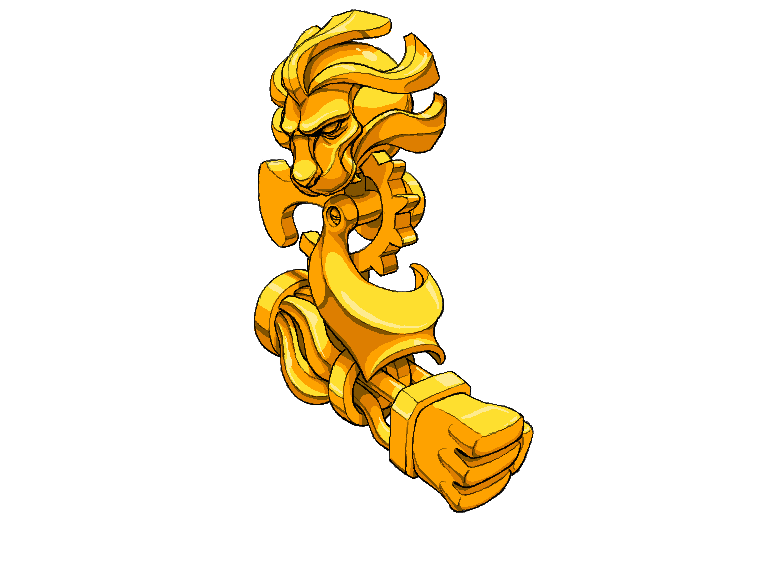 This ability uses the super bar as its resource, just like her super moves do. Of course, this ability needs to be balanced in such a way, that her super moves do not become useless, while keeping her from becoming too strong. The mechanics that use shatter/time/health as resource are more difficult to implement, and are definitely further down the road. The chances that we use time as a resource to power a character’s abilities are very slim. Note that utilizing a resource doesn’t mean to us that it will necessarily be consumed, it could also mean that having X amount of health/time left has a certain effect on a character. 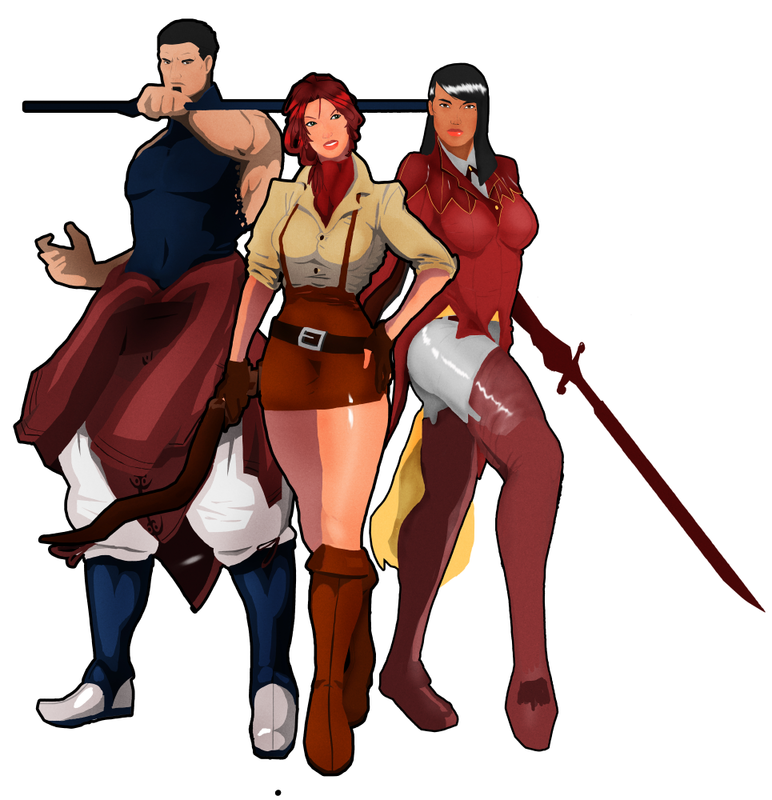 Over the next few weeks we will do a more in-depth introduction to our 3 other alpha characters Usha, Cole and Roxanne. This entry was posted in Design on February 16, 2014 by Marijn. We’ve received some questions about what we will be doing with the Netplay for Shattered. We’d like to give you guys some insight into to plans concerning online play. Fighting games are one of the most unforgiving genres of games when it comes to online play. Even the slightest delay in your inputs can be detrimental to landing your combos and reacting in time to an opponents attack. This means there’s technically only one solution, and that is rollback netplay. Rollback netplay ensures that there is zero delay for both players. Both players send their inputs simultaneously, and once your receive the input of the player several frames later, the move that was supposed to come out is retroactively placed into your game. As there is no way to completely get rid of delay, this means that once the game state is corrected the move will have already begun, and you’ll miss the visual cue of some frames of the start up of a move. This is usually not a problem, when the delay is fairly low between two players, but it can, sometimes lead to the dreaded ‘rollbacks’. If you press a move that hits before the opponent received the data that says you pressed the button, it is possible that you see your move hit, and a few frames later suddenly find the opponent magically blocking it. Some players find these rollbacks incredibly annoying, and for this reason prefer delay-based netplay over rollback netplay. But the magic of rollback netplay is that it can be both! Rollback netplay can also let you choose to manually set an amount of frames of delay, to whatever number of frames that you still consider playable. This gives the netplay more time to figure out what is happening, and therefore increases the visual fidelity. We have not decided on whether we will license a third party rollback netplay, or whether we will implement our own netplay. If the latter is the case, we luckily have access to excellent technical articles by Ponder (the creator of GGPO) and Mauve (the creator of Rollcaster) detailing the issues and technicalities of rollback netplay. This entry was posted in Gameplay on February 2, 2014 by Marijn. We’ve been making some great progress with the engine lately. Damage and chipdamage. And characters can be KO’d when their life bar is completely drained. Bob Sagat has also finalized the knockdown animation, so now we can see Julia flying through the air in all its sprited awesomeness. To show all of this off, we’ve put together a little showcase with some bread and butter combos of Julia. The lifebar is currently represented with placeholder art, it will of course be replaced later on. This entry was posted in Uncategorized on January 19, 2014 by Marijn. As we mentioned in earlier blog posts, we wanted our art style to be based on the comics of European and American tradition, as opposed to the manga style that is almost universally present in fighting games. One of the issues this can produce is the dissonance between the sprites and the artwork. Sprites with a lower resolution such as ours will always have some ‘manga qualities’ simply because low resolution almost automatically means that facial features will be bigger. There are some workarounds for it and some studios managed to do this with alternative ways of spriting, but in a lot of these instances there are noticeable sacrifices. A complete and truthful conversion is hard to create. During the creation of our world we’ve had several shifts in design. The most noticeable was us slowly moving away from the steampunk direction we originally envisioned. There are certain aspects that survive, but we’ve settled for a more early 20th century look on the main location of our game, the city of Amsterdam. Other places and characters might still draw inspiration from a 19th century or even a steampunk look. Julia, the character we already introduced, is a good example of this. While steampunk can deliver a broad and vivid world, we felt that it is a too narrow a style to create a complete world, it stayed as an influence, but its no longer the theme. It’s our world to create, and we want it to be diverse and wonderful. Above picture features features some of the characters we hope to someday include in our game. The middle one is Julia Verne, who we’ve already introduced in previous posts. To her left is Kojiro, a sword fighter who has seen some redesigns in the meantime. The woman to the right is Roxanne Vasquez, she is a soldier of the Inquisition which is a gigantic faith driven army. The Inquisition is one of the key factions in the game and feature a distinct stylization and color palette, which will more than likely return in the artwork in one of the stages in our game. These characters designs represent the look and feel of our game, and display some of the style and culture of the people that inhabit our world. The coming weeks we will discuss the upcoming characters, Ushah, Cole and Roxanne, who together with Julia will kick off our games Alpha version. This entry was posted in Background, Characters, Story on December 15, 2013 by Marijn. Throws are an essential part of fighting games. Throws are unblockable, and therefore play an essential role in breaking the defense of someone who is focused on blocking all incoming attacks. Without these unblockable techniques playing defensively would become too strong of a strategy. Throws in Shattered are executed by pressing the two punch buttons simultaneously. Every character has a regular throw, which will be fairly quick (currently, we are prototyping with 3 frames start-up), some character also have special moves that function as throws. If a throw hits it will usually knock down the opponent, which allows you to continue pressure. If you are being thrown, you can break the throw (but not special throws!) by pressing the two punch buttons, in a small window at the start of a throw. We have not yet decided how big this window will be, but we are currently prototyping with 12 frames, which can be reacted to if you are really on point. If this turns out to make throws too weak, we will make this window smaller. Of course, characters are completely throw invincible during blockstun, and throws generally cannot be comboed into either. Also after hitstun and blockstun you will be invincible to throws for a few frames. This will make the strength of tick throws less dominant. We want throws to be used as a means to break the opponent’s defense, not as a really fast unblockable poke. Finally, we would like to show you the throws working in a early build of the game, as you can see, the throws still use placeholder animations. Enjoy! This entry was posted in Gameplay on December 1, 2013 by Marijn. In the past weeks, you have already had the chance to see some of the animations of Julia. Julia is a fighter that uses her bow to shoot bolts of energy, and uses it as a striking weapon to add extra punch to her attacks. In this post we will discuss her gameplay. Julia is the most basic character of our cast, a jack-of-all-trades. She has normal and special moves that basically cover most angles of attack. This does not mean she has the perfect answer to everything, but she will not have an explicit weakness in a certain area. Julia fills the so-called ‘Shoto’-archetype from the classic fighting games. Although Julia is a fairly basic character, this does not mean she is a simplistic character. We intend to make her an interesting and deep character, with plenty of room for mastery. Julia does not have long extended juggle combos. Instead, she mostly focuses on simple normal to special cancel combos. This makes Julia the ideal character for beginning players, and players who like to focus on the fundamentals of fighting games, rather than perfecting long difficult combos in training mode. In previous videos, we have showed off some of Julia’s basic movement animations and special moves. As one would expect from a Shoto, she has a projectile, a flying uppercut and a horizontally moving kick attack. While special moves are the moves that make a character distinctive and recognisable, no character could function without its normal moves. The video below showcases the normal moves of Julia. This entry was posted in Characters, Gameplay on November 17, 2013 by Marijn.